Hello there friends! 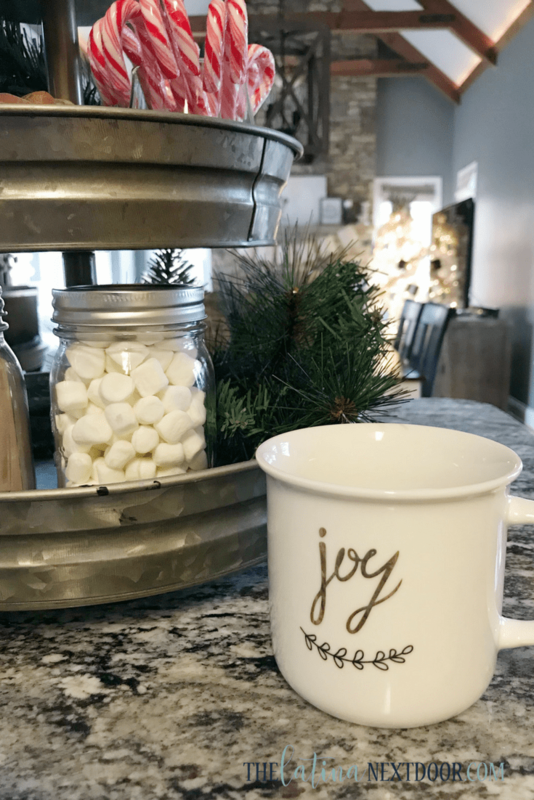 It is day SEVEN of this Christmas Blog Hop and today we are talking Hot Cocoa Bars! 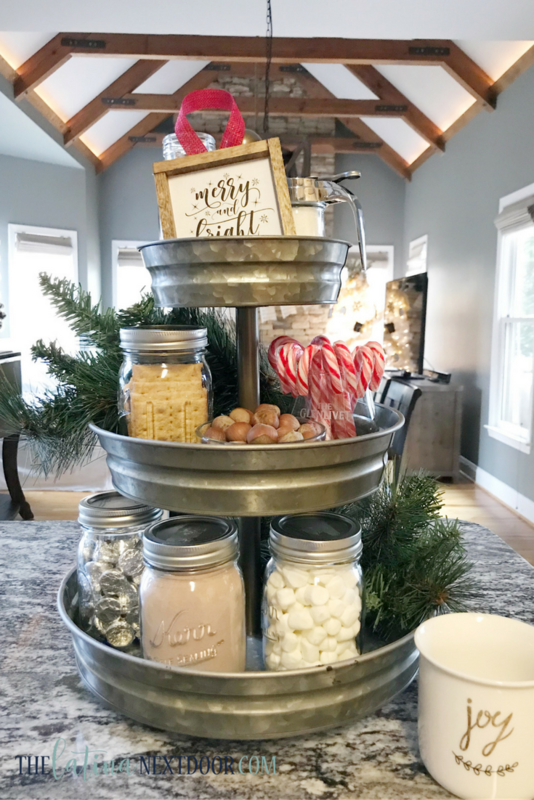 I have never really had a hot cocoa station at my house before, however, my 5 year old daughter who just debuted her first video on YouTube, absolutely loves hot chocolate so I thought it would be fun to use my galvanized tiered tray that I purchased at Hobby Lobby a while back to set something fun up as a mini hot cocoa bar for the kiddos and for anyone who comes by this season. 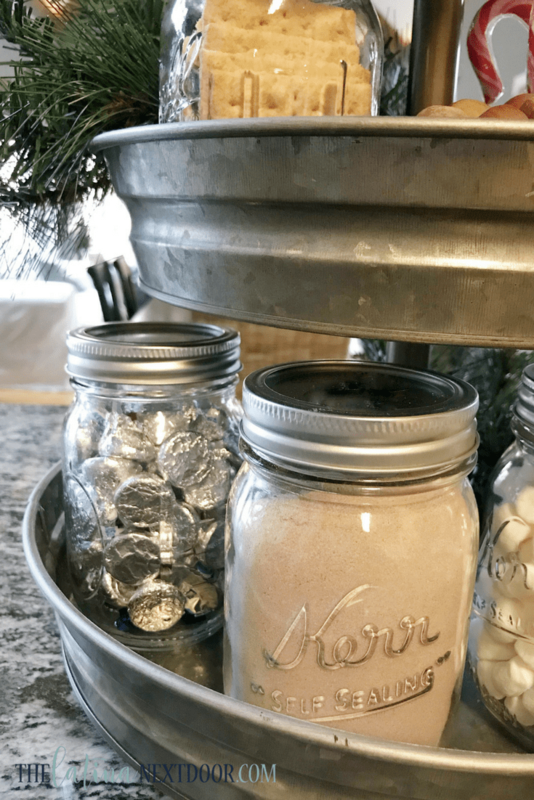 I also added this mason jar filled with Hershey kisses in case anyone wants their hot cocoa extra chocolaty or happened to walk by and need a “fix” LOL! 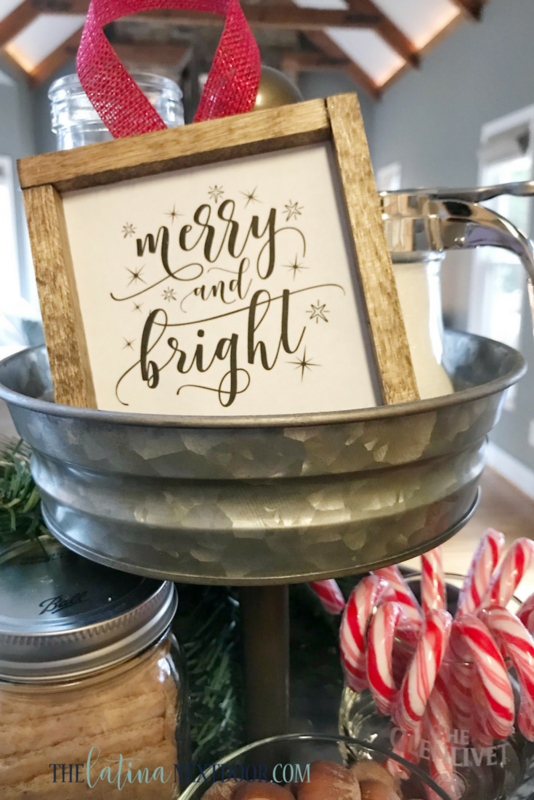 I added one of my DIY mini wood sign ornaments as a topper for fun. As you can see there are candy canes, but those are more to make the tray look pretty or to just eat on their own, boy do my kids love them! And finally I enjoy my hot cocoa in these cute “JOY” mugs I also purchased at Hobby Lobby. They are simple, but the gold “joy” makes it so classy. Love it. I also added a few sprigs of pine to give it a more festive touch and added some nuts and graham crackers to snack on, but that is pretty much it! The kids love sneaking a candy cane or kiss from the mini bar and I just think it looks so cute. Perhaps I will make something more substantial next year, but for now this one sits on my kitchen counter overlooking the breakfast area and keeping room. Filed Under: Blogger Collaborations, Food... Buen Provecho!, For the Holidays! Really pretty! I love the clean, simple look with the tins and the jars. The mugs are the perfect touch. Thank you! I do appreciate the simplicity and the fact that everything is easily accessible. And yes, I love those mugs! I wish I had bought extra. There is nothing better for organizing things into a pretty grouping than a nice three tier stand. Your is so well done, I love it. Thank you Leanna! I totally agree. I have a thing for tired trays now. LOL! That is the cutest every day hot cocoa bar!